Do you have a favorite local pizza shop? Barber? Custom kitchen-nob designer? Of course, we all do. But chances are, that pizza shop is better at tossing dough and baking than staying on top of finances. And that’s the way it should be -- small businesses should focus on delighting their customers. Too often great businesses -- particularly small and local businesses -- struggle or go away completely because they fail on the financial mechanics of running a business. That’s why today we are excited to announce our investment in ScaleFactor, focused on empowering small businesses to make the best strategic and financial decisions. The company builds intuitive software to automate accounting, tax and finance tasks to save business owners time and money. We are thrilled to be leading their Series A alongside our friends at TechStars, Broadhaven and Citi Ventures. The most compelling factor behind this investment is the team. We frequently talk about founder-market fit, but in Scalefactor’s case, it was truly “team-market fit”. CEO and Founder Kurt Rathmann began his entrepreneurial career as a 15 year old when he mowed lawns to raise money in order to invest in another business idea - "smart lighting" controlled remotely (Nest 1.0?). Since then, Kurt and ten other colleagues have gone on to receive their master’s degree in accounting which today informs one of the most complete and thoughtful bookkeeping products in all of small and midsized businesses (SMB) fintech. An early-stage investment requires a partnership to build alongside the team -- I am excited and appreciative to be alongside this group on their journey. In addition to Kurt’s smart lighting business, there are 19 million companies in the U.S. with under 100 employees, according to the Small Business Administration. All of them need to keep track of finances and ideally automate the painful, time consuming financial tasks that they’re forced to complete manually. Unfortunately today, they’re stuck between an Excel spreadsheet and software that can cost over $100,000. ScaleFactor is a complete platform to manage finances and business intelligence data which helps small businesses focus on growing. For starters, the company is offering automated solutions for: inventory, invoicing, taxes, forecasting, bill pay, payroll classification and 1099 management. A typical small business might use services like Xero or Quickbooks for accounting, Gusto for payroll, Expensify for expense management, Shopify to manage ecommerce channels, Salesforce for sales and marketing dashboarding or Bill.com for bill pay. Instead of using those independently, ScaleFactor built integrations and serves as a seamless hub for all financial operations. The needs of small businesses have been overlooked for a long time. For example, it sounds crazy but most real-time accounting solutions for small businesses don’t have a mobile app. ScaleFactor recognized early on that business owners are busy cutting hair and / or designing the latest and greatest in kitchen-nobs - it’s not practical to always be in front of a laptop to understand how your business is doing. In today’s dynamic world of small business operations, real-time access to data is table stakes and the ScaleFactor team recognized that from day 1. ScaleFactor is also building technology to help businesses get ahead, not just meet their basics needs. Cash flow is a top concern for most small businesses, particularly ones that are just getting started. They ask questions like: will I be able to make payroll? How can I better anticipate the next slow season? ScaleFactor built an early warning system with these topics in mind. It uses machine learning to look at previous trends from a variety of data sources and give automated insight on revenue, payroll and other business-critical statistics in order to warn a business before cash flow or other indicators become an issue. This approach is the business intelligence resource that large enterprise companies have had for a long time, and SMBs are now finally getting. 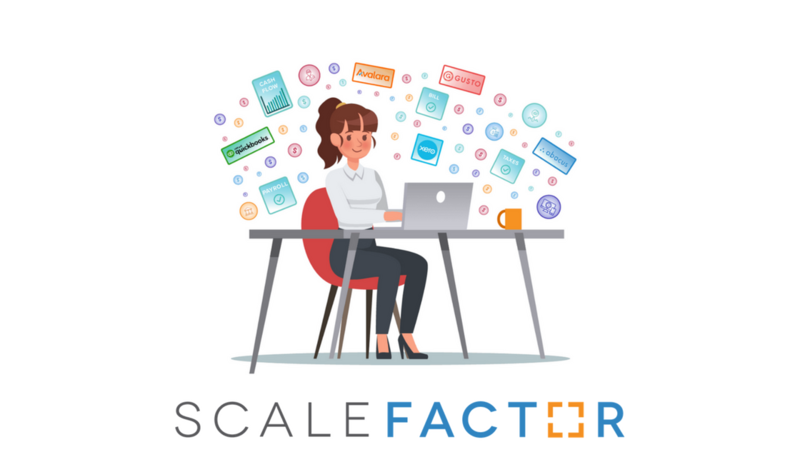 The story of ScaleFactor and the potential of the company is an example of the massive untapped opportunity we see in SMBs -- and we’re just getting started at ScaleFactor. Great products built by teams that understand their customer will win. Small businesses fuel our economy and are beloved in our communities -- many are enthusiastic ScaleFactor customers. The company is still growing but their industry-leading SaaS metrics clearly paint a picture of what it would look like to prioritize the needs of those businesses -- it’s a massive unserved market we’re thrilled to pursue with the team at ScaleFactor.